Join Mr and Mrs Rabbit as they count through the twelve days of Christmas. Rhyming text and beautiful, hand-stitched illustrations make this an ideal book for parents and young children to share. 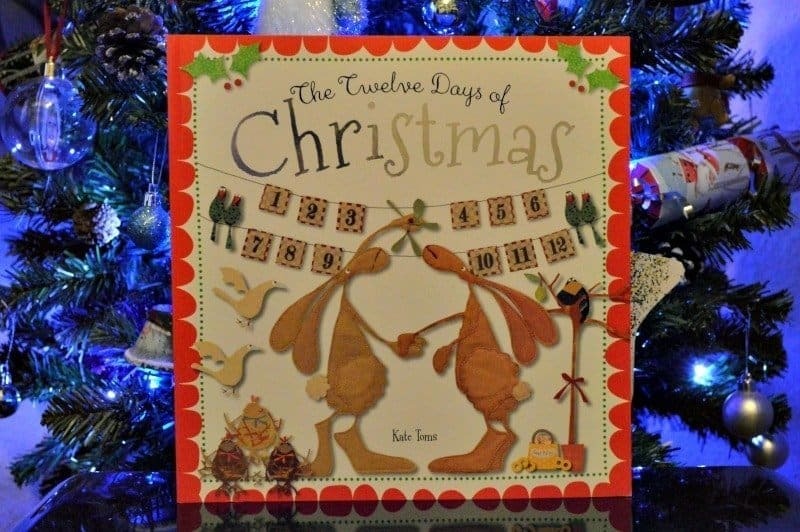 The Twelve Days of Christmas is a wonderful, holiday-themed title from Kate Toms. Kate’s signature hand-stitched illustrations and her witty, charming rhymes are popular among children, and this book is no different! Read Kate s witty take on the famous rhyme and enjoy sharing this wonderful book together! You are guided through the twelve days of Christmas by Mr and Mrs Rabbit who look more like kangaroo’s than rabbits which really confused Tigger. Despite the unusual animal selection the twelve days of Christmas remain traditional and gently reminds you of familiar gold rings and leaping lords. Available from Amazon (affiliate link) and The Works with a £5.99 RRP although currently on offer for just £1.99 at The Works. Disclosure: I purchased a copy of The Twelve Days of Christmas to include with our Christmas Book Advent. Previous Post: « Calorie Counting Christmas: Can You Maintain Your Diet Whilst Indulging In Holiday Treats?